We have 8 unique and exciting Game Maps which we use for our Paintballing and Laser Tag games. Each of these game maps will test your skills. Read on to find out more about each game map, your mission as well as any hazards and terrain details that you need to be aware of. Enjoy and have fun! Game Map: Morning Glory – Wake up to the biggest surprise ever! YOUR MISSION – Capture your enemies flag and bring it back to your cabin! Whilst working your way through your opponent’s soldiers, only then will you truly avenge the heroes that have fallen before you. HAZARDS AND TERRAIN – You will need to have courage to traverse the bisecting gorges, criss-crossing streams and surrounded by 100ft creaking trees, creep through the forgotten graveyard while bones and tomb stones of past heroes crunch at your feet. Advance closer to the abandoned huts where your enemy are camping out! You will need to negotiate the thick toxic swamp before you can attack! You could attack to the left or the right, both will deliver you to your enemies; will you have the true courage and valour to honour the fallen? NOTES! – This game zone has panoramic view from our safe area it’s a great one for spectators to watch! Players need to watch out for the swamp of doom it’s known for swallowing shoes whole, and the occasional player – great viewing entertainment though! Game Map: Regime Change – Search, find and destroy! YOUR MISSION – The rebels have finally liberated the country, but the dictator has gone to ground – you must search, find and eliminate the dictator! HAZARDS AND TERRAIN – All the information we have points to him being held up with a single large artillery weapon, a Land Rover and a tank of unknown chemicals! One team in favour of his power and money will fight to the bitter end to protect the old regime; the other under a UN mandate must bring this man to justice by any means possible. NOTES! – Fancy being the dictator for the day? If you and your close protection team can stop one shot to your chest and torso alone then the game is yours, but if your opposition can assassinate you then its game over… literally! Game Map: Tower Demolition – An end to the bloody battle! YOUR MISSION – The Columbian government have hired you and your team to take out the final outpost bringing an end to the bloody battle which has been raging for years. HAZARDS AND TERRAIN – Deep in the Columbian jungle, Rodríguez and the Cali Cartel operate their last base of operations. The objective is simple get the bomb on the tower, the execution however is not; firstly you must fight your way through Rodriguez men of equal number and deadly skill before taking the bomb to the very heart of the tower. The 25ft tower is based in a deep and dark ravine. Do you risk it and take the high ground where there are open walk ways and ramps. Or do you face the risk of swamps, deep waters and steep banks and scramble your way right or left of the tower. NOTES! – Players come back time after time to attempt to ‘take the tower’, is it your time for glory? We often reverse this game around so that everyone gets the chance to be a Colombian drug cartel for the day. Game Map: Carry on Caravan – Attack and Defend! YOUR MISSION ATTACK – The site of an old woodsman hut has been overrun by the defending bandits; you must take them out one by one to reach the hut before the time runs out! HAZARDS AND TERRAIN – Get down the hill as fast as you can, with shots flying out from the roofs and doorways of huts; taken a hit? Not a problem, how about a regeneration pack… that will take your enemies by surprise. There are huts, barricades, swamps and streams, use them to aid your advance! YOUR MISSION DEFEND – Defending bandits or just liberators, you must hold your ground and defend the hut at all cost. HAZARDS AND TERRAIN – With huts on multiple levels, are enemies above or below you? Your enemy can’t regenerate for long and then their all yours for the killing! Its fast paced and high adrenaline, so you better be ready. Right and left you have huge 100ft trees to creep amongst, barricades to dive behind and huts to camp out in, but be aware of the enemy who can creep onto the roof, bullets won’t suffice, smoke grenades and flash-bangs are essential for survival! NOTES! – Don’t worry if things don’t work out first time around, we will reverse this one so teams can taste both sides of the action! Game Map: Burial Mound – Be aware of the un-dead! YOUR MISSION – It’s now up to you and your crack team to get to the bottom of what exactly is going on. Some say it’s haunted by the roman gods, others think its mutant workmen or maybe it’s just the foxes and badgers. HAZARDS AND TERRAIN – Built on the site of a roman burial mound this is a sacred site for many, its recent new owner has turned it into a dumping ground for cars and radioactive waste, but something has gone terribly wrong. Things started going bump in the night just over a month ago! This square area is diagonally crossed by an old sunken roman road and burial ground, littered with the cars of employees past and filled with badgers warrens for further good measure, fight to capture your opponents flag and return it to your base, whilst all the time defending your own flag from your enemies. Along with the abandoned cars there is dense scrubland, mixed with wide open spaces, you’ll need eyes in the back of your head for this one! NOTES! – Will you conquer your fear or end up the pray of the un-dead! Game Map: In the Trenches – A game of stealth! YOUR MISSION – Can your team reach the central flag first, even so it’s not over yet, you need to get that flag all the way to your opponents starting position for the full reward. HAZARDS AND TERRAIN – Crawling forwards barrel extended in front of you, you know your enemies are somewhere in the trench system, but where? Every corner you turn puts you one step closer to capturing the central flag but also closer and closer to your enemy. Whose nerve will break first, yours or theirs? Creep through trenches some filled with water others mud, deep or shallow you’ll need to keep your wits about you! Long grasses and shrubs will aid your advance but what is lurking behind them? NOTES! – Do you dare break the cover of the trenches and make a run for it, or keep low and crawl to victory. Game Map: Suicide Alley – Will the arena live up to its name! YOUR MISSION – You must capture the central flag and then deliver it to your enemies base, but do you have the bottle? HAZARDS AND TERRAIN – Ahead of you lays a deserted waste-ground strewn with derbies and barricades. The adrenaline courses through your veins, you enemy’s aren’t far away; their screams and calls can be heard behind the rustle of distant trees. It’s down to your fight or flight reaction. NOTES! 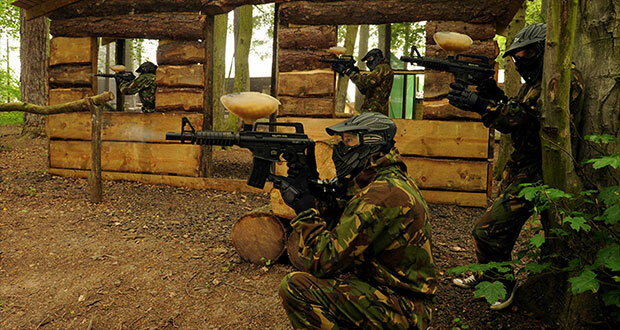 – This game is often played as our grand finale, the ultimate culmination to a day’s paintball! It’s a hard and fast game, you are going to have to be quick to win this one, but don’t worry if you get taken out in the first few seconds regeneration gives you the chance to get straight back into the action. Game Map: Little Wood – Back to the old school root of paintball! YOUR MISSION – Fight to the death, last man standing wins! It’s American Commandos vs. Viet Cong. HAZARDS AND TERRAIN – Deep in the Vietnamese Jungle it’s warfare at its best, a few forgotten soldiers are still fighting for their lives deep within the jungle, unaware the war is over! In this dense woodland arena, you’ll need to navigate to the enemies’ base without being consumed in the 2 acres of jungle, stinging nettles and deep water. Retrieve their flag and bring it back to your compound. Wild Park Derbyshire welcomes you to try to make it out alive – do you dare! NOTES! – Fight to the death who will win!